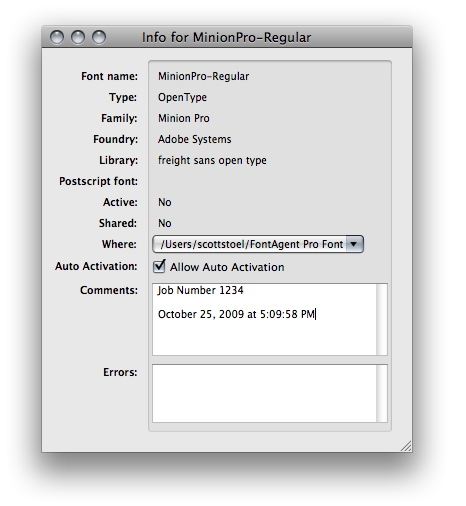 In an earlier post I wrote about AppleScript and how we can automate some common tasks using it with FontAgent Pro. Here is a script that allows you to take advantage of one of FontAgent Pro’s cooler features–adding comments to fonts to use as search metadata. 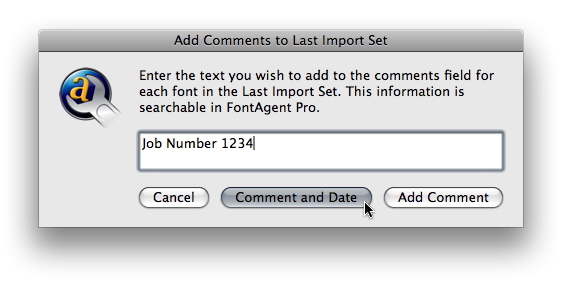 You can manually add comments to fonts in FontAgent Pro by performing Get Info on a font (Command + i on the keyboard) and adding data to the comments field. Once you have added the comment information, you can use the Filter tool in the All Fonts view to search for the fonts by Comment in your collection. 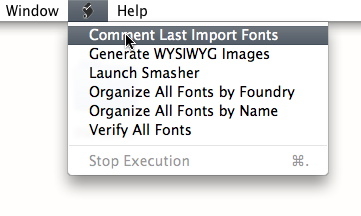 You can also use Smart Search to search your fonts by Comment and even save the results as a Smart Set. But, if you noticed something about this process, there is no easy way to add comments to a bunch of fonts at one time. This is where AppleScript comes in. 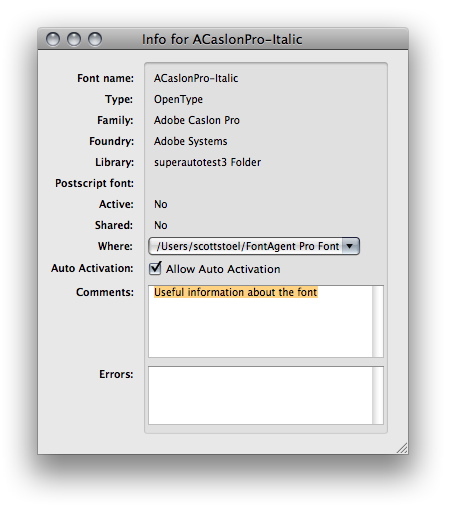 Download and unzip the file linked here and place the script in the /Library/Application Support/FontAgent Pro/Scripts/ folder to get it to appear as “Comment Last Import Fonts” in the FontAgent Pro script menu. 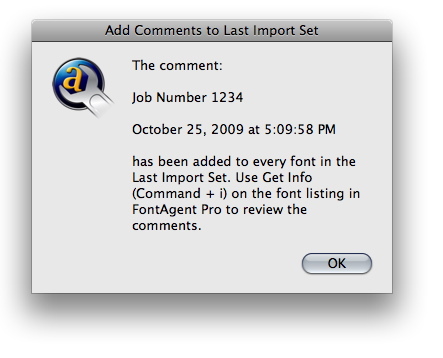 When you run this script it will present you with a dialog where you can batch add comments to all the fonts contained in the Last Import set in FontAgent Pro. The situation where this comes in very handy is if you are working at a job where you would like to tag fonts for individual projects as you import them. This script would be useful in this workflow because when you import your fonts into FontAgent Pro, in addition to adding them to a library of your choice, they are also automatically added to a set called Last Import. After that you can run the script by selecting it from the Script Menu in FontAgent Pro and add the comments you would like to attach to those fonts when prompted. In the example below, I added a job number and also opted to add the date to the Comment field as well. After the script has run, you will be alerted that FontAgent Pro had added the comments entered to the font’s listing in FontAgent Pro. Now when we do Get Info on one of these fonts, we can see that the comment information has been added to the font where it is searchable, as mentioned earlier, in FontAgent Pro. Other cases where this would come in handy is with FontAgent Pro Server. As an administrator, you can add Comment information before uploading fonts to FontAgent Pro Server, then set up Smart Sets on the client-side that would automatically update the contents of of those sets using the comment metadata provided. This script is editable and can easily be customized to fit any workflow. So once again, the fun does not have to stop here. 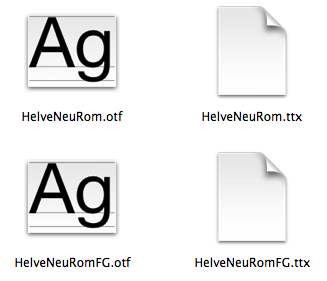 Stay tuned to FontGeek as I plan on regularly adding more scripts and other font-related workflow solutions. 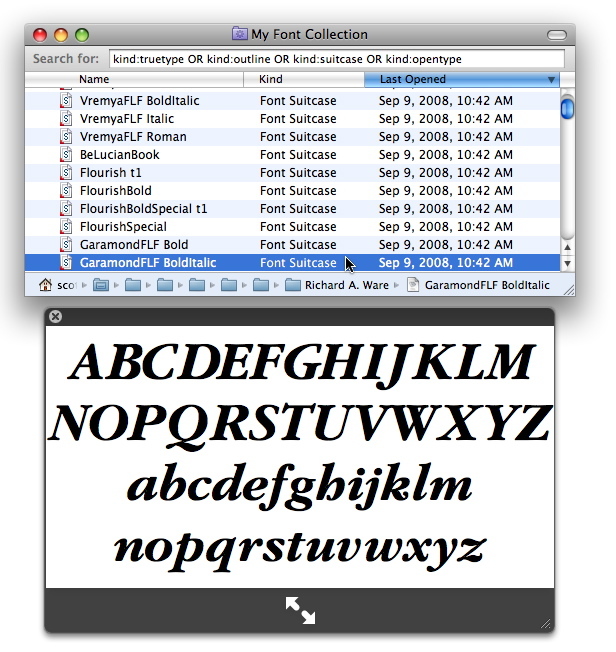 If you are a graphic designer chances are you have been collecting font for years, and these collections can get huge. Chances are they are not neatly organized in one folder. Wouldn’t it be nice if there was a way to gather them all in one location? Well you can. 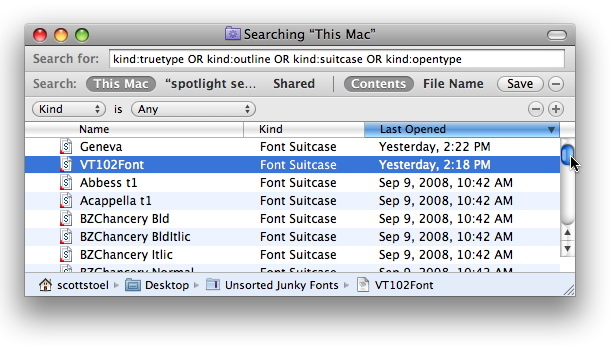 With Spotlight, the Mac OS X search utility, you can create a Smart Folder where all your fonts can be easily found. First go to Finder and type Command + f (or select File>Find… from the menu bar). this will open a new Search window. Make sure you have “This Mac” selected in the Search bar so you are searching the whole system. 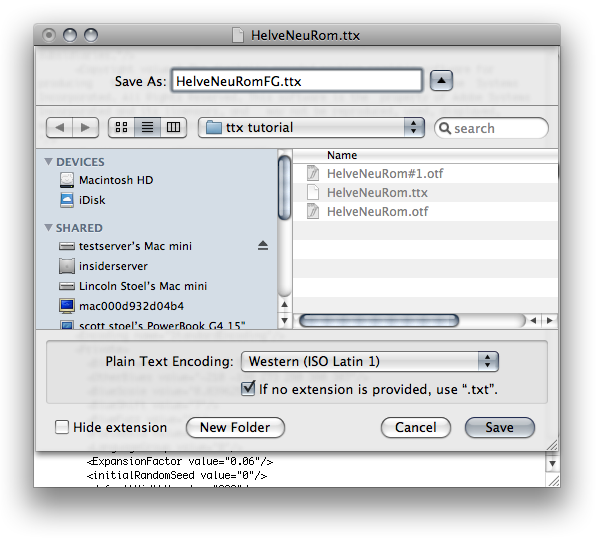 Spotlight can use regular expressions so if you you type in the line below (or copy and paste), it will find every font on your Mac that Spotlight has indexed. 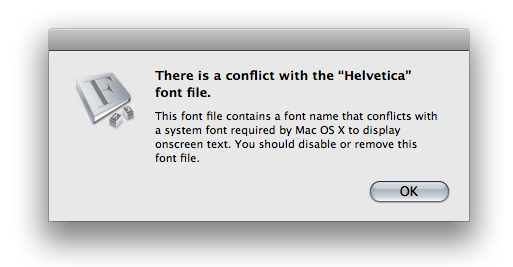 This returns a list of all your fonts on your machine. 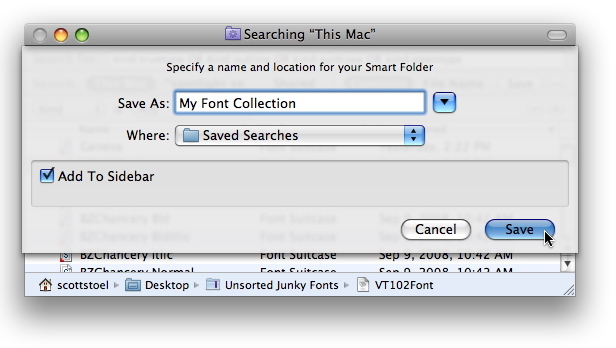 Now if you hit the “Save” button, you can give your give your Smart folder a name and Save that. Notice that you can opt to add the Smart Folder to your sidebar where you will have easy access to it every time you launch a window. This is very cool because not only are your fonts listed in one location, if you are running Leopard, you can select a font, hit the space bar and with Quick Look, get a preview of the font. Then, you can click on the up or down arrow on your keyboard to change the preview to the next font in the list. Depending on the size of your collection, you now have a great way to kill a few hours wistfully going through your fonts, fondly remembering the project where you first used Filosofia, or cringing at the memory of a brochure you created when the client insisted you use Comic Sans.